When considering the investment in a metering system, one should take into account not only the initial investment, but also the costs of the whole system lifetime, such as maintenance and eventual upgrades. Oulun Seudun Sähkö selected Aidon both because of the future-proof open and modular system architecture and the advanced remote upgrade possibility. 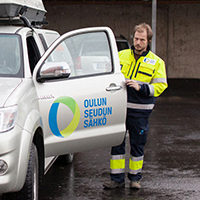 The updating functionality was tested when Oulun Seudun Sähkö added a low-voltage network management feature to its AMS. Thanks to Aidon’s solution, it could be done from one central point without physical visit of the meters. At Oulun Seudun Sähkö the meter reading system Aidon Gateware is integrated with the Enoro Customer Information System and ABB’s DMS distribution management system. Thus metering and monitoring information from the remote reading system can be utilised both by customer services and network management. Aidon’s low-voltage network management feature integrated with the DMS system allows the operations department of Oulun Seudun Sähkö to receive real-time alerts if faults in the end customers’ electricity distribution occur. Moreover, dangerous neutral wire faults and phase wire breakages will be alerted immediately. In case of a fault in the medium-voltage network the system will show which parts of the low voltage network are affected. Corrective actions can be taken immediately even before the consumer detects the error. This enables proactive customer services.